My wife and I home school our children for many reasons. Those reasons are moral. Educational. Financial. And they are all significant. But when Mater et Magistra asked me to write a “why we home school” article several years ago, I had a more Freudian answer. Strong psychological forces urged us to home school: irrational emotional fears in my case; sound developmental strategy in April’s case. 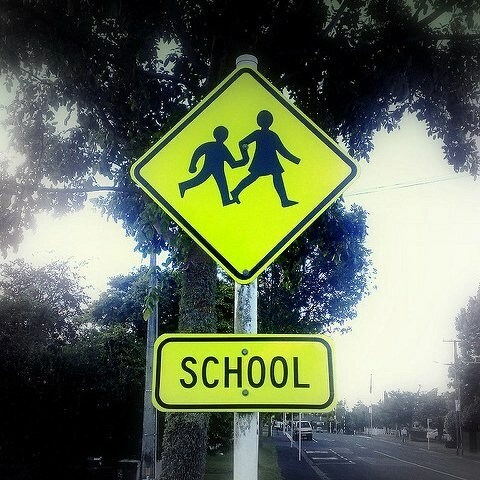 I still get a tight feeling in my gut when I see “Back to School!” signs. It’s the same thing I used to feel as a kid in Tucson, Ariz. I would seize up with fright. The perky exclamation point especially irked me. It was like a judge’s gavel with a smiley-face on it. “Back to School” was my sentence. I hated school. I hated sitting still. I hated being forced to negotiate the politics of 8-year-olds’ social relationships. I hated having to figure out what version of an answer a teacher wanted. I hated feeling ripped in an untimely way from the world I knew and placed in an artificial world I knew not. And most of all, I hated math. Meanwhile, miles away in California, the beautiful young April Beingessner was undergoing a very different psychological process. To her, the “Back to School” sign was the welcome sign on the gateway to the community of learning. She had a rightly ordered attitude toward school. School for her was a place to build her future in brief forays into another world. Her school day began at home with her mother waving good-bye and ended at home with her mother’s welcoming hug. Home gave her a foundation. School was a chance to discover herself in relationship to others; home base, and mom, were always there, waiting. The two phenomena have the same root cause. By the time we showed up, schools had ceased being places that complement home life. They had become places that contravene home life. John Dewey and his followers did that purposely. The fathers and mothers of the modern education system wanted schools to remold young people into good citizens — as they conceived good citizens to be. Families deeply inculcate values in children. That includes good values to reinforce, like altruism, but also bad values to mitigate, like racism. But the reformers threw the baby (family-rooted culture) out with the bathwater (occasionally backward values). Actually, it was even less benign than that: One of the “bad family values” to be discouraged was religion — the basis of meaningful social order. By the 1970s the school system had grown into a kind of Plato’s Republic world of children being educated in a set of virtues that didn’t come from their families or their churches but from secular experts hired by the state. The end result is that, when we began having children and we started talking about school, I instinctively recoiled and April stepped forward and we decided to home school. We are aware that there are great schools and dedicated teachers who are finding ways to integrate school with the home in a much more complementary way. We love them! We send our teens to the Benedictine high school in town because at a time when their social life becomes more important to their development, it can provide key formative social opportunities we can’t — and we want our children to experience these first while they are under our roof, with our guidance and correction. We are aware that home schooling has its own set of negative consequences. Very much aware. Very personally and painfully aware. Why do we home school nonetheless? Because I don’t want the kids to hate school, and April doesn’t want them to hate each other. Or to put it positively, because our culture needs to be re-rooted in the family. The best place we can do that is at home. My only regret: they still have to take math.